If you’re looking for a quick and affordable way to instantly update the look of your home without having to spend hours and hours refurbishing or renovating, then you’ve come to the right place. 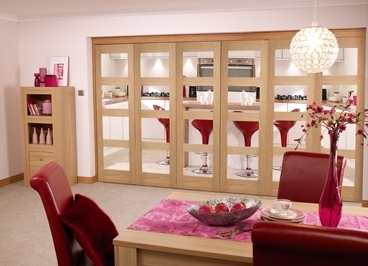 Here at Vibrant Doors we offer a range of folding doors to suit every home and every need. On this page, we’ll introduce you to our beautiful pre-finished oak 4L roomfold doors. Featuring four glazed panels on each door this product is clean, modern and beautifully crafted. Available in 3, 4, 5 and 6 configurations you shouldn’t have a problem finding a set of doors that are just the right size, especially since you can also choose either 1’9”, 2’0” or 2’3” panels. All of our internal bifold doors operate on a top hung system which means there’s no need for any tracking at floor level. This means that the opening and closing mechanism is much smoother, as it can’t get blocked with dirt or debris. So, make the most of your home today with the oak 4L roomfold doors. Please note that these doors are supplied with the following parts: doors, frame pack (supplied unfinished to allow you to match it to your existing skirting boards and architraves), running hardware, head track and hinges. No handles or drop bolts are supplied, so you can match these to your existing choices in the room.